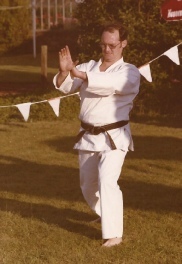 Sensei Danny Bryceland (3rd Dan), at presentation of club championships. 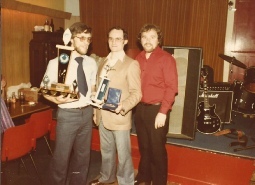 Danny was instrumental in Andy(Snr) continuing Karate and was an excellent Sensei for the club. 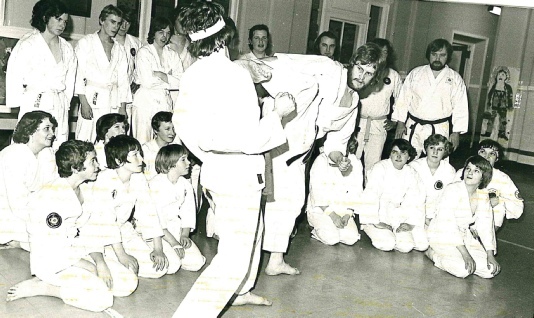 Seniors training with World Champion Sensei Gene Dunnett in Newmains Primary School. 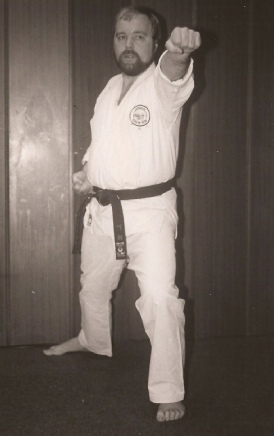 (Newspaper reads) ANDY MURDOCH was badly injured in a car crash three years ago – and that looked like the end of his practical interest in karate. Doctors told him he would never practise the sport again. However, just over a year ago he got so annoyed at being inactive that he decided to try the sport again – despite the doctors’ advice – and against all the odds he regained his fitness and his agility. 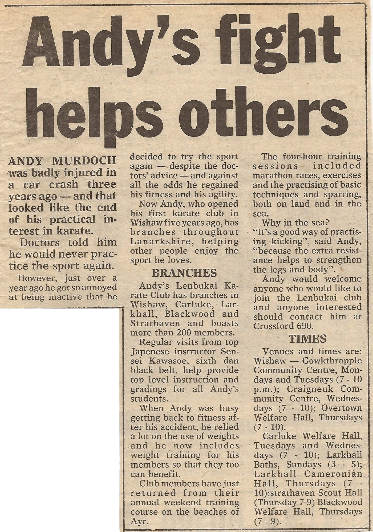 Now Andy, who opened his first karate club in Wishaw five years ago, has branches throughout Lanarkshire, helping other people enjoy the sport he loves. 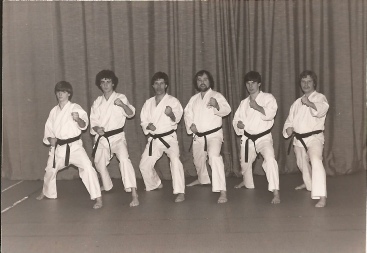 Andy’s Lenbukai Karate Club has branches in Wishaw, Carluke, Larkhall, Blackwood and Strathaven and boasts more than 200 members. Regular visits from top Japenese instructor Sensei Kawasoe, Sixth Dan black belt, help provide top level instruction and gradings for all Andy’s students. When Andy was busy getting back to fitness after his accident, he relied a lot on the use of weights and he now includes weight training for his members so that they too can benefit. Club members have just returned from their annual weekend training course on the beaches of Ayr. 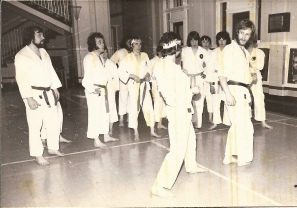 The four hour training sessions include marathon races, exercises and the practising of basic techniques and sparring. Both on land and in the sea. “It’s a good way of practising kicking”, said Andy, “because the extra resistance helps to strengthen the legs and body”.